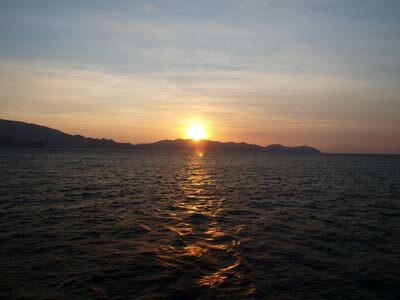 Golden Passage is a small channel between Gili Lawa Darat and Komodo Island, right at the north-eastern end of Komodo. 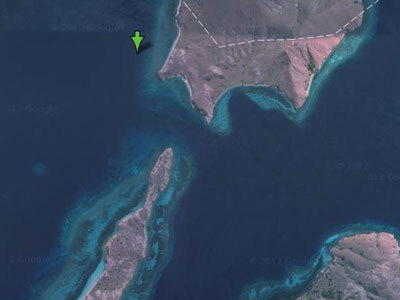 Gili Lawa Darat is a small island about two by one and a half kilometres in size. An approximate GPS mark for the dive spot is 8° 28' 24.1"S 119° 33' 00.3"E (using WGS84 as the datum). The site is located to the south-east from the GPS mark. The actual dive is into the channel between the two islands. The channel is about 300 metres wide, with the deeper part about 200 metres wide. Although virtually all dive sites that you do when on MV Mermaid II are done from a RIB (rigid inflatable boat), this site may start from the boat itself. The RIB was used to push the rear of the Mermaid II towards the shore and we dropped into the water once we were closer. This put us over the reef in about seven metres. Once in the water, we dropped to the reef and then followed the edge to the south and then east. The reef dropped to about 15 metres. The reef here consisted of hard corals with lots of soft coral. There were many small gaps in between the coral and lots of smaller tropical species. There were a few firefish as well. After about 15 minutes we entered the channel. Once we were in the channel, we left the main reef and headed south over the black sand. The depth here got to 24 metres. We spent most of the dive on the sand, seeing some colourful sea cucumbers with shrimp, a few different species of nudibranchs. There was also a very large moray eel that that was quite interested in the GoPro's video lights. At this spot I lost Kelly as there were so many other divers around that I followed the wrong person for a while before discovering that the green fins were not her's. I never did find her, so I headed back with some of the others towards the main reef on the northern side of the channel. Once on the main reef, I headed west and then north and retraced my steps back to the reef near the Mermaid II. I spent the remaining time in the shallows near the boat where there was plenty to see. This was only an average dive, certainly not up to the standard of the other night dives we did on this trip. The visibility was probably 25 metres at the most and the water temperature was about 27°C. Click here to return to see the dive profile from my computer.